NRT develops the capacity and self-sufficiency of its constituent community conservancies in biodiversity conservation, natural resource management and protection, and natural resources based enterprises. The ongoing and increasing threat of elephant poaching in the Laikipia-Isiolo-Samburu ecosystem (with the second largest population of elephants in Kenya) is the primary conservation need addressed by this project. 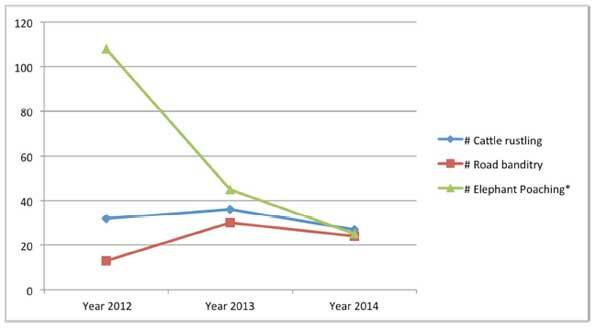 The increased effectiveness of the joint anti-poaching team supported by this project has led to significant declines in elephant poaching throughout NRT (see below) and reversed the trend which had been steadily increasing throughout 2012. The presence of the joint anti-poaching team has also helped improve the civil and government security response to the theft of livestock and highway banditry as the same people are frequently in all three activities. The following information is from the NRT Interim Report to IEF for the period of May-October 2014. The support by the International Elephant Foundation to Northern Rangelands Trust’s (NRT) 9-1 & 9-2 anti-poaching security teams in 2014 has been instrumental in significantly reducing previously rampant elephant poaching within and around the 22 community conservancies found in the North and South of Ewaso Nyiro River. The 2 anti-poaching teams comprise rangers drawn from different community conservancies from the two regions. Historically north of the Ewaso River comprising of Sera, Biliqo-Bulessa, Melako and Namunyak conservancies are areas with high concentrations of elephants but prone to cattle rustling, ivory poaching and road banditry. 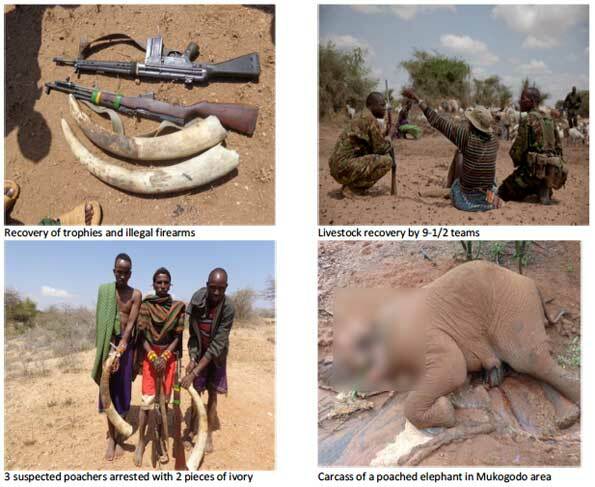 The presence and prompt response to any incidents by well–trained and equipped anti-poaching teams has effectively reduced poaching, road banditry and livestock thefts in this region as well as the adjacent South of Ewaso Nyiro region comprising of 6 conservancies (Nasuulu, Lekurruki, Leparua, Mpus Kutuk, Nakrupat Gotu and Il Ngwesi). Given the connectivity between the poaching of Elephant, road banditry and stock theft, NRT actively deploy the teams to follow up on all cases. This policy has enabled a significant reduction of illegal activity’s resulting in a reduction of poaching during 2014 with an overall total of 53 operational deployments during the period to October 2014. Significant achievements have been made in terms of combating livestock theft incidents whereby livestock recoveries were made in 27 incidences compared to 36 incidents in 2013. Only 25 out of the 69 elephant carcasses found in NRT conservancies were as a result of poaching compared to 45 and 108 in 2013 and 2012 respectively. A total of 24 road banditry incidents were recorded during the period compared to 30 in 2013 with the anti-poaching teams making successful follow ups on 13 incidents. This has significantly improved security along the Marsabit – Isiolo highway and adjacent areas and reflected in a reduction in the number of elephant poached during 2014. The teams’ impact was also reinforced by the close collaboration with the Kenya Police, Kenya Wildlife Service. Engagement with respective community conservancies also played a great role in making arrests of 6 suspects found in possession of 6 illegal firearms and 4 pieces of ivory. Technical support from Lewa Wildlife Conservancy and Ol Pejeta Conservancy in providing reinforcements and aerial support to poaching incidences enhanced the effectiveness of the teams. Specialized training by 51 Degrees Ltd of the anti-poaching teams in weapons handling, combat operations and advanced first aid conducted early in the year also assisted in the teams’ effectiveness. Northern Rangelands Trust hereby appreciates the contribution from the International Elephant Foundation towards safety and protection of wildlife in our landscape. The 9-1 and 9-2 anti-poaching teams operate in the North and South Ewaso Nyiro River regions covering a total 14,900 KM2. These two regions have the second highest concentration of elephants in Kenya. Before advent of the mobile anti-poaching teams in 2010, ivory poaching was rampant, together with cattle rustling and road banditry incidents which affected security of wildlife and people living in the region. The need to combat poaching and insecurity incidences led to the establishment of the specialized anti-poaching teams who are well trained and equipped. Supported by Kenya Wildlife Service, Kenya Police and intelligence gathering and sharing by the 22 community conservancies operating in these regions, significant strides have been made in the reduction of elephant poaching, road banditry and cattle rustling. Support to the anti-poaching teams has been instrumental not only to the protection and security of wildlife, but also plays a great role in ensuring peace and security of the communities living within NRT’s landscape in northern Kenya, necessary for bolstering their livelihoods and economic development. Goal: To improve security of wildlife and people residing in northern Kenya. Objective(s): To reduce ivory poaching and other insecurity incidences in northern Kenya’s Ewaso Nyiro eco-system. Improved security of wildlife and people through effective collaboration with KWS, Kenya Police and community conservancies. All though the teams where on constant patrols through out the area there were a total of 53 specific deployments carried out by the 9-1 & 9-2 teams in poaching and insecurity prone areas within the North and some parts of the South of Ewaso Nyiro river, with Namunyak, Sera, Biliqo-Bulessa and Melako. Intensified patrols and response by the anti-poaching teams have led to the arrest of 8 suspects. However, in June 2014, operational response to a livestock theft incident around the Melako and Sera conservancies turned tragic when one of the team members, Mr. Ltodamwa Lordagos, a brave ranger from our specialized ‘9-1’ security team lost his life in an exchange of fire with cattle raiders. All the livestock were recovered in addition to 4 firearms as a result of this incident. Another 4 pieces of ivory and 5 more firearms specifically M-16 and AK-47 were recovered in separate incidents during the period. The anti-poaching teams, in collaboration with KWS and Kenya Police, have been proactively engaging the community conservancies in terms of gathering and sharing of intelligence on poaching and insecurity leading to arrests and interrogation of suspects by the government agencies. A total of 8 suspects involved in illegal possession of 9 firearms and 4 pieces of ivory were arrested during the period and availed to the government agencies for prosecution. Effective patrols and rapid response by our anti-poaching teams has made the once prone Isiolo-Marsabit road safe from road bandits. 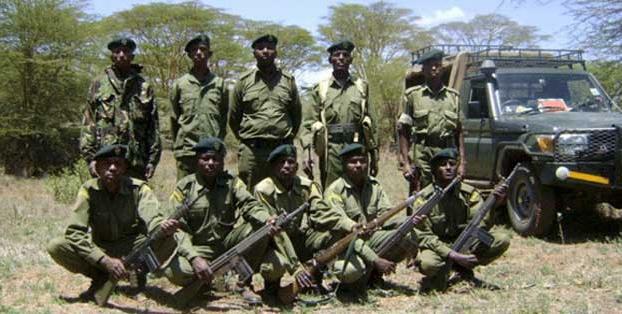 The use of sniffer dogs from Lewa has been useful in tracking down the bandits and poachers. Of the 24 road banditry incidents in and around the NRT conservancies, the antipoaching teams made swift follow-ups on 13 incidents leading to arrests of 2 suspects who were handed over to the Kenya Police. During the period to October 2014, a total of 69 elephant carcasses have been reported in and around NRT conservancies this year. Of these, 25 were the results of poaching, showing a 33% reduction from previous year, compared to 45 and 108 elephants poached in 2013 and 2012 respectively. The complete Proportion of Illegally Killed Elephant (PIKE) report for 2014 will be prepared at the end of the year for analysis and measuring progress towards achievement of the objective of reducing poaching. Continued use of Lewa’s Mozaic Monitoring System and NRT’s W-CoMMS has enabled mapping of poaching hotspots and planning for the requisite patrol intensity. NRT has been using GPS-GSM based implants to monitor and track movements of rhinos and elephants along the Ewaso ecosystem. Positions of tracked elephants and rhinos are relayed to ranger commanders to provide a guide to the wider distribution of herds and high-risk individuals. Immobility and unusual movement alarms will send GPS coordinates to a centralized communication centre of any implanted animals to facilitate rapid responses to potential poaching incidents. In addition, a satellite tracking system is used to show area of coverage of 9-1 and 9-2 teams within the NRT conservancies. Aerial support from NRT’s two NRT aircraft, 5Y-NRT and 5Y-KTP have provided back up as required to the two anti-poaching teams in terms of surveillance during the anti-poaching operations. During the period, the aircrafts flew over 250 hours in responding to poaching, elephant treatment and rescue as well as surveillance of the poaching and insecurity hotspots within the Ewaso Nyiro eco-system. Sadly during the year 5Y-KTP was destroyed in an accident and we are currently in the process of acquiring a replacement aircraft. Improved intelligence gathering and sharing of information on poachers and criminals by the community conservancies, KWS and the Kenya Police. Intensive engagements of the communities in terms of awareness on wildlife security, volunteer basis of gathering and sharing of intelligence on poachers and criminals with the community conservancies, KWS and Kenya Police has been instrumental in combating elephant poaching and containing cattle rustling and road banditry incidents within NRT’s landscape. Specialized training of 30 rangers from the 9-1 and 9-2 anti-poaching teams conducted early in the year on weapons handling, operations combat and first aid has borne fruit resulting in effective patrols and security response with minimal causalities. Better equipped anti-poaching teams in terms of weaponry, uniforms, camping and communication equipment coupled with specialized training not only provides confidence in the face of confrontation with poaching incidences but enhances their response capabilities to overcome the poachers. Use of GSM – GPS technology in monitoring and tracking movement of elephants within and around the Ewaso ecosystem proved effective in facilitating rapid responses to potential poaching incidents.